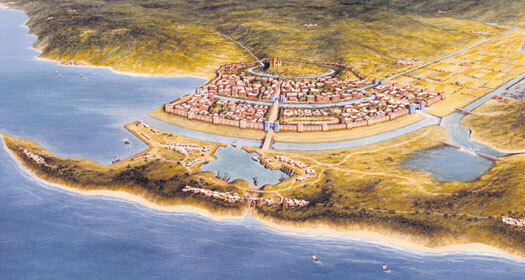 Mysia was a semi-legendary kingdom which was located in the north-western corner of Anatolia, occupying much of the southern coast of the Sea of Marmara. 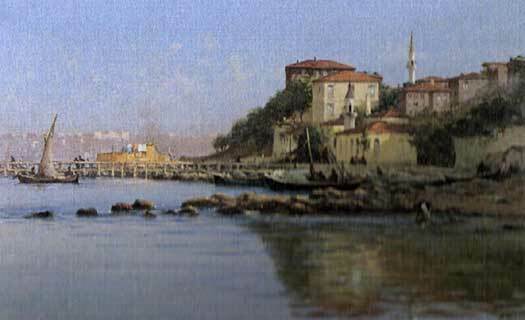 Today this territory is split between the northern parts of Balikesir and Bursa provinces in Turkey, but for the first millennium AD it was firmly part of the Roman and Byzantine empires. Mysia (pronounced me-see-ah) should not be confused with the Roman province of Moesia in the Balkans, although the names are sometimes connected by claims that Mysia is named by Celts in the third century BC when they migrate into Anatolia to form the kingdom of Galacia. This explanation is unsatisfying because it fails to account for the use of 'Mysia' in connection with the Mycenaean age, some seven hundred years previously. Theoretically, though, Mysia could have existed outside Greek myth and history. This would see it placed as the fifteenth century BC Arzawan sub-kingdom of Masa (see map link, right). This region (or people) was the subject of a Hittite campaign under Arnuwanda I prior to his gaining the throne. During the same period he campaigned to bring his father-in-law, Madduwattas of Zippasla, to the Arzawan throne, and the attack on Masa could have been part of this process. David Ross suspects that Masa was on the other side of the Hellespont in what became Thrace, and that its people were ancestors to the Phrygians and Armenians. In terms of general Hittite campaigning areas, though, this seems less likely. It may be more reasonable to suppose that none of their western Anatolian campaigns left Anatolia itself. To the immediate west of Mycenaean-era Mysia was the Troad (of which Mysia was part) and Wilusa. 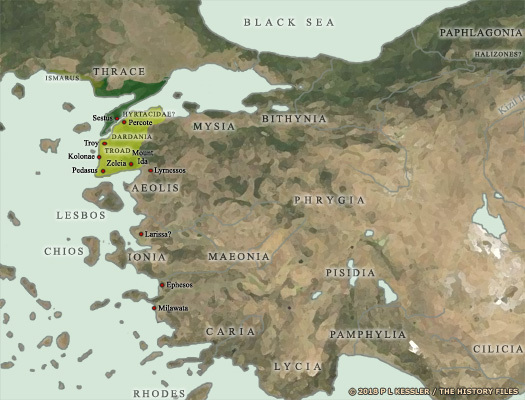 By this time the Phrygians were beginning to migrate across the Hellespont to the immediate north and settle beyond Mysia's south-eastern border. Maeonia, to the south, was separated from it by Mount Temnus. While those borders are difficult to pin down, apparently for periods of its existence Mysia also extended over areas of western and southern Anatolia, before being submerged within Phrygia. The northern section of this highly mountainous kingdom was known as Mysia Minor or Hellespontica. The southern section was called Major or Pergamene after its major settlement, and it is this that eventually became the heart of the later kingdom of Pergamum. Information on Mysia's kings comes largely from Herodotus and the dates have been estimated to bring them into line with those established for the Trojan War. Herodotus is reliable in many ways, but the heroes of the Trojan War predated him by over seven hundred years, so the oral tradition which had kept them alive could easily have been corrupted by the time it was written down. However, Herodotus does state that the Mysians were of the same stock as their near neighbours, the Lydians. Potential support for this comes from the fact that the two were always stationed together in the later Persian armies (although that could also be due to the fact that their home states were similarly close together). If they were indeed related then it would make them Luwian-speakers, and much more potentially Arzawan stock. The other possibility, raised by Strabo, is that they were immigrants from Europe. This means that they were more likely to be a group of Phrygians who settled in Anatolia a few generations ahead of the main ingress of Phrygian migrants. Their earliest king, Daskylos, is the son of [a] Tantalus, who could be the early Phrygian king of that name. Daskylos appears to have a confused role in ancient sources. He is either the king of Mysia (and seemingly the first, or at least the earliest to have been recorded), or he rules a tribe known as the Mariandyni. They could be one and the same, of course (his son, Lykos, is acclaimed as the king of the Mariandyni in Mysia when he meets the Argonauts). Normally, though, the Mariandyni are placed on the opposite side of the Bithyni from Mysia, and the Bithyni were a tribe which seem to have been hostile towards the Mysians. Reconciling the difference seems impossible, unless perhaps the Mariandyni occupied territory on both sides of the intruding Bithyni or were gradually migrating from their northern flank to their western flank along the shore of the Sea of Marmara. In Greek mythology, one Mariandynus was the eponymous hero of the Mariandyni tribe, with no apparent connection to Daskylos, so the weight of evidence seems to favour Daskylos being in Mysia. Son of Tantalus. First king of Mysia or chief of the Mariandyni? Connected with Heracles and the Argonauts of Jason of Iolkos by ties of hospitality, Daskylos rules Mysia. Other sources say that he rules the Mariandyni, a tribal group to the north-east of neighbouring Bithynia - which would place them on the other side of Bithyni territory from Mysia's location. In fact a tribal background for many of the Mycenaean-era kings is much more likely than them ruling well-established cities in this wild and barely-tamed region at the far edges of the Hittite empire or the kingdom of Arzawa. The coastal city of Dascylaeum (or Dascylium) in Caria may be named after him but may equally be for Daskylos, son of Periaudes. Daskylos of Mysia fathers several sons, named Lykos, Otreus, and Priolas, while his own father is Tantalus (possibly an early king of the still-tribal Phrygians, with the estimated dates matching up perfectly, or one of the Tantalus figures mentioned for Maeonia, although the estimated dating here is harder to match up. Otrea, on Lake Ascania (now Lake Iznik in Bursa Province, Turkey) is a settlement within Mysia which may be founded by Ortreus. The settlement of Priola near Hereclea may be founded by his brother. Both Otreus and Priolas are killed by Amykos, king of Bithynia. Otreus is taken while travelling to Troy to sue for the hand in marriage of King Laomedon's daughter, Hesione. The Mysians would appear to be recent arrivals in the region (just like the Phrygians), and are no doubt attempting to cement their position. Son. King of Mysia or chief of the Mariandyni? Jason of Iolkos embarks on a quest to find the Golden Fleece. He gathers together the Argonauts, the crew of his ship, the Argo, and experiences various adventures along the way. Jason is roughly datable as he is of the generation that precedes the participants of the Trojan War. When he makes landfall near the Hellespont, he defeats Amykos of the Bithyni, to the advantage of Lykos of Mysia. Lykos welcomes Jason and entertains him and his men. The Argo loses two of its crew during this break in the voyage, these being Tiphys (of sickness) and the doomed Idmon (killed by a wild boar), while another, Idas, attempt to steal the throne and kingdom from Teuthras. Lykos' own son, Daskylos, joins the crew with one Ankaios in order to make good the losses. The alternate name of Teuthraea as used in Greek mythology for the region of Mysia originates from Teuthras. Although the survival of the renamed kingdom is relatively brief, the name sticks to a district within Mysia. As for Teuthras himself, he is opposed in his reign by Idas, formerly a shipmate on the Argo. Rival for the throne. Defeated by Telephas of Arcadia. Telephas, of uncertain birth in Mycenaean Arcadia, travels to Mysia with his mother, Auge. There she either marries the king or is adopted by him (sources differ). After Telephas defeats Idas, who has been threatening to usurp the throne, Teuthras adopts Telephas (or has already done so when adopting his mother), and he inherits the kingdom. Adopted Mycenaean son of Teuthras. The Mycenaean Greeks set sail for Troy and, unaware of its exact location, land in Mysia instead. As enemies of Troy, to which Mysia owes some ties of allegiance, they are attacked by Telephas. Famed Achilles of Phthia strikes back, wounding the king. When the Greeks help to heal his wound, Telephas shows them the route to Troy. In the last year of the Trojan War against Mycenae, Eurypylos forms the Mysian forces as allies of Troy, along with Chromis and Ennomus (an augur who is killed by Achilles), and perhaps with Gyrtios too. Eurypylos is killed by Neoptolemus of Phthia, son of Achilles. Following the sack of Troy, Phrygians are now free to migrate across the Hellespont to the immediate north of Mysia and settle on its eastern flank. With this in mind, it is likely that the small kingdom of Mysia experiences a good deal of disruption, possibly along with the rest of the Troad - although it is also possible that the kingdom has been ruled by Phrygian migrants and their adopted Greek descendants and is simply swept away by the sudden change in the regional situation. The kingdom apparently collapses (or simply disappears from history) soon after Troy's fall and the territory is eventually occupied as part of the early kingdom of Phrygia. By 547 BC Mysia has become part of the kingdom of Lydia, at which time it is conquered by Persia and created a province within the Lydian satrapy. Demaratus, former king of Sparta, is made governor of the cities of Pergamum, Teuthrania, and Halisarna in the province of Mysia. His descendants inherit the office over the subsequent eighty years or so. Mysia itself is rarely important enough to warrant a mention in history, but subsequent references to it are handled under the Lydian satraps.